Graal-Müritz looks back in a long History. Our community moved from a medieval leasehold on the coast to a modern Health Spa. Graal-Müritz is a popular location for families, singles and spa tourists - all year long. 1328 First documented mentioning of the settlement of Müritz. The word „Müritz“ is Slavic and means „region on the shore“. 1352 Expansion of the of the St.Clair nunnery property, which owns the settlement Müritz. 1525 The first settlement in Graal is established, which is described as leasehold property in later documentation. 1567 Graal is mentioned in Rostock's tax documents for the first time. The border between Graal and Rostock is the creek Stromgraben. 1752 Graal is divided into small properties. 1753 The first bylaw is issued in Graal. 1806 Both settlements (Graal and Müritz) are occupied by the French. After joining Napoleon's army, soldiers receive supplies to build houses in Müritz upon return. 1816 Müritz becomes a village. 1830 Drastic increase in spa-tourism. 1840 The beaches in Graal and Müritz are mentioned for the first time in publications. 1852 Beginning of construction of the mill in Graal. 1872 A storm surge destroys the coast. 1877 Dr. Carl von Mettenheimer (personal doctor of the Duke of Mecklenburg) discovers the special environmental properties of Graal-Müritz that are beneficial to general health. 1880 Opening of the first hotel, Hotel Anastasia, in Müritz. 1884 Dr. Carl von Metternheimer opens the first children's hospital on the Baltic coast. 1903 The first school is built in Müritz with one classroom and one teacher apartment. 1905 Piers are built in both villages. 1907 Founding of the warrior and men sports club „Good Health“. 1908 The Duke and Duchess inaugurate the Lutheran church and graveyard. 1909 Construction begins of the water works and a water reservoir tower for both villages. 1921 Graal and Müritz receive electric power. 1924 The German Red Cross buys land in Graal and builds the first recreational home for children. 1925 The Berlin Transportation Company builds recreational facilities. The company becomes the main shareholder for the connecting train system to Graal-Müritz, which was opened in July 1925. 1938 The communities of Graal and Müritz are merged by decree and are now Graal-Müritz. 1941 The piers and boardwalks are destroyed by rough sea and ice. 1942 Parts of Rostock's children's hospital are moved to Graal-Müritz after bombing of Rostock. 1945 On May 2nd, Graal-Müritz surrenders without resistance to the Red Army. 1947 The first tourists return after the war due to the workers' union holiday programs. 1951 The recreational center owned by the Berlin Transport Company is renamed after the politician Richard Aßmann. 1953 Due to communist policies, multiple hotels are nationalized. 1954 A special needs school for physically handicapped students opens on September 1st. 1955 The local government decides to found the Rhododendron Park. 1958 Dr. Bernateck becomes the medical superintendent for the sanatorium „Richard Aßmann“, who develops the clinic into one of the leading rehabilitation centers of the German Democratic Republic. 1960 Graal-Müritz receives official recognitions as a coastal health spa. 1968 After the destruction of the beach due to flooding, the boardwalk is moved to the west of the city. 1970 The communal agricultural production coops are dissolved. 1986 The Rhododendron Park receives the recognition as a state natural landmark. 1990 The AKG buys the sanatorium and restructures it as a rehabilitation center. The TSV 1926 sport club's soccer team enters a regional league for the first time. 2000 Beginning in June, the local „TUKI“ bus improves the transportation system. 2001 Rebuilding of the groin in Graal-Müritz. 125th anniversary of the volunteer fire department. 2002 Graal-Müritz exceeds a population of 4,000 for the first time. 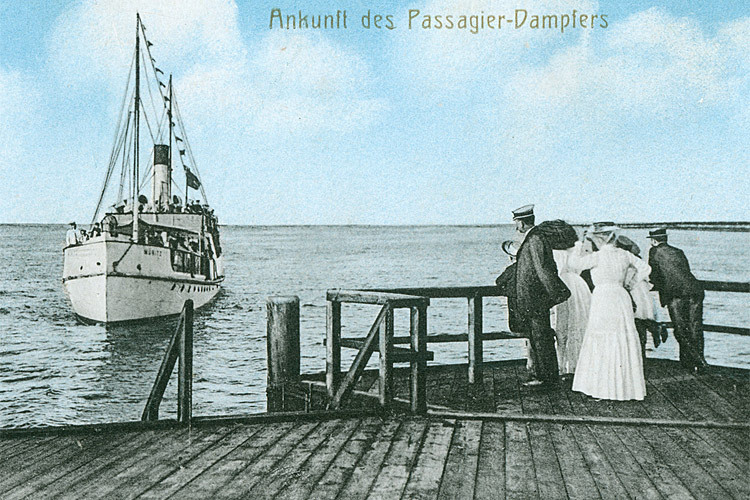 Reopening of the maritime traffic to Graal-Müritz. Graal-Müritz celebrates its 675th anniversary. 2004 The „Heimatstube“ (local culture museum) becomes a full-fledged museum. Opening of the sports and recreational center, Aquadrom. Reopening of the train tracks between Rostock and Graal-Müritz. 2008 Inauguration of the new pavilion in the Rhododendron Park. 2012 Under the motto „Great Art,“ a total of 9 sculptures to touch, sitting or climbing were set up on the promenade. These larger than life-size sculptures are supposed teach children about the flora and fauna of the Baltic Coast.